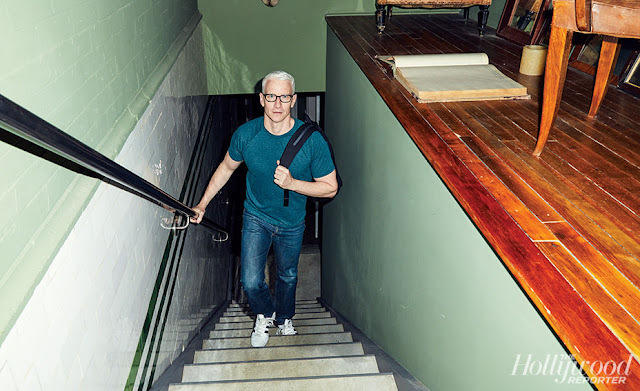 The Hollywood Reporter trails the busiest man in TV news as he bounces back and forth from his West Village firehouse to CNN, interviewing nervous White House staffers ("Are you reading from your notes? 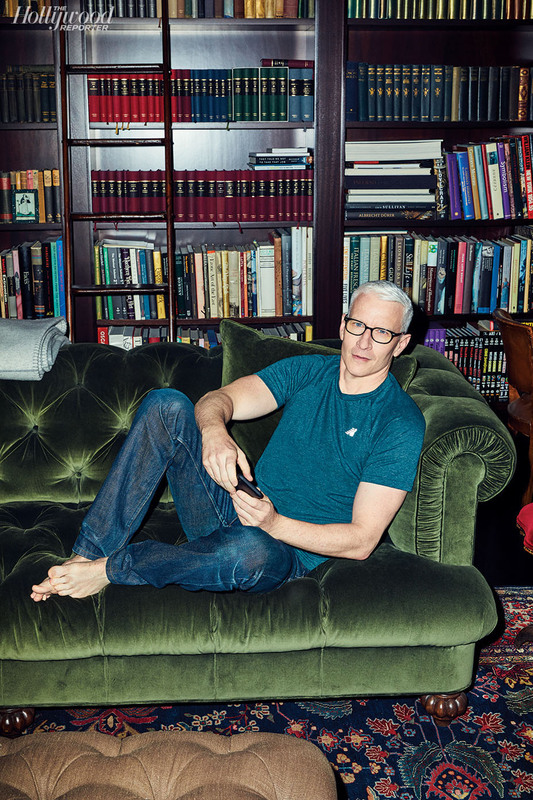 "), planning trips to hotspots and FaceTime-ing with his old buddy Andy Cohen. 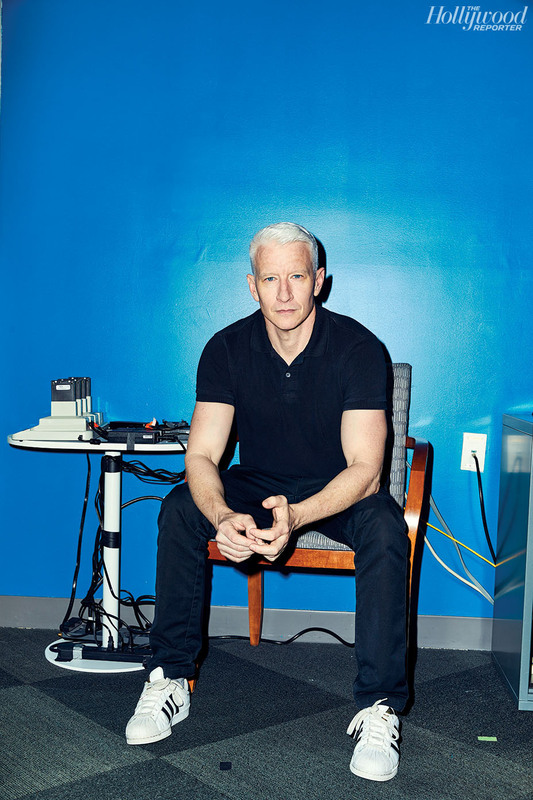 "I am not good at, like, sitting on a beach," admits Anderson Cooper. "I'm not good at decompressing." Lucky for Cooper, he seldom has time to. The 51-year-old news anchor spends nearly every day, including weekends (and especially New Year's Eve) working. There's Anderson Cooper 360, his five-nights-a-week newscast on CNN, which enters its 15th year this September; his gig as a 60 Minutes corre­spondent (he'll shoot 10 pieces for the CBS newsmagazine this season); and his new Facebook news series, Full Circle; not to mention the live road show he does with pal Andy Cohen, AC²: Deep Talk and Shallow Tales. It's not like he needs the money: The son of heiress and artist Gloria Vanderbilt, Cooper grew up in the rarified world of Manhattan society. But he's experienced terrible losses — his father, screenwriter Wyatt Cooper, died during open-heart surgery when Anderson was 10; his older brother, Carter, died by suicide at 23 after jumping from the terrace of Vanderbilt's penthouse — and those tragedies, he says, are the reason he started roaming the globe as a young freelance journalist to war-torn places like Rwanda and Somalia, searching for others who "spoke the language of loss," and why he still travels to hotspots as much as possible (he has a chemical warfare travel pack that includes a gas mask and Tyvek suit: "Airport security always looks at me askance"). In just the last two months Cooper has been to Singapore, Helsinki, Brazil, D.C., San Diego, Los Angeles, San Francisco and Seoul. "I feel lucky to travel the world and tell stories. I come back from a weekend and I feel transformed. And then I'll ask my friend, 'What did you do this weekend?' And they'll say, 'I saw a movie.'" 2 P.M. MONDAY, AUG. 13 Cooper has just arrived at his office on the seventh floor of CNN's headquarters in the Time Warner Center ready to begin his workday. He's got only two hours before the 4 p.m. editorial meeting, during which his news staff of 20 producers will go over stories for his 8 p.m. broadcast, but he spares a few minutes to show off the contents of his office closet — his on-air wardrobe of about a dozen nearly identical Ralph Lauren sport coats, all in dark shades of black, gray or blue — before diving into the pile of newspapers on his desk. Every so often, he takes a swig of coffee-flavored Soylent, his second bottle of the day. "I don't care about food," he says, nodding toward the mini-fridge stocked with the energy drink that purports to provide all known human nutritional needs. "So I'm trying to replace all food with this because it would be, like, three fewer decisions in a day." 4:03 P.M. MONDAY, AUG. 13 Executive producer Charlie Moore leads the afternoon meeting in front of a whiteboard in the newsroom outside Cooper's office. The program will lead with a report on Omarosa Manigault Newman's just-published White House exposé, Unhinged, and the surprise revelation that she surreptitiously recorded conversations with top White House officials. Cooper asks Moore whether there is any video of Trump talking about Omarosa at the beginning of his administration. "He made hiring 'the best people' part of his campaign," he says. "Are there tapes of him praising her?" 5 P.M. MONDAY, AUG. 13 Back at his desk, Cooper leans his iPhone against a bottle of Soylent (his third) and places a FaceTime call to his old friend Andy Cohen. The two are planning a trip to Croatia in a few weeks and, during the chat, Cohen warns Cooper that it may turn into a working vacation, since Cohen wants to spend time plotting out the details of their next stage tour. "Well, we talked about it theoretically," murmurs Cooper into his phone. "I didn't know it was actually happening." "Well, sweetie," Cohen replies to Cooper's waffling over working during their upcoming vacation, "we're going to be gone for like eight days together — don't you think [planning the tour would] be a productive thing to do?" Cohen and Cooper have known each other since 1995 when Cooper was set up on a blind date with the Bravo host. The date never happened, but they've been close pals ever since and despite their pronounced personality differences: Cooper is an introverted homebody; Cohen seems to lead a life of perpetual exhibitionism. They launched their comedic two-man stage show in 2015. Last year, after the controversy over Kathy Griffin's severed-Trump-head stunt, Cohen joined Cooper as co-host of CNN's New Year's Eve coverage. 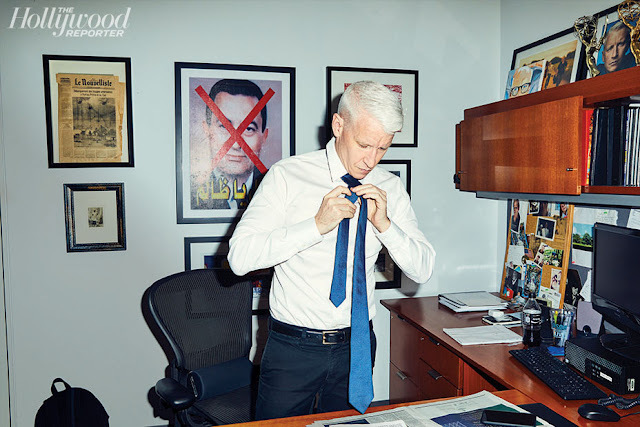 7:30 P.M. MONDAY, AUG. 13 Cooper has changed into a dark gray jacket and blue tie and heads to the studio to pretape a segment in which CNN legal contributors Jeffrey Toobin and Alan Dershowitz argue over the limits of Trump's pardoning powers. The debate ends after 14 minutes, with no clear winner. 9:02 P.M. MONDAY, AUG. 13 The show is wrapped, and Cooper is in his office. The jacket and tie are gone — he's once again in a black T-shirt. He slings a backpack over his shoulder before shutting off his lights and heading out the door. "I'm a night owl," he says. "I stay up till 1 or 2. I watch a lot of TV [like The Rain on Netflix and The Missing on BBC]. When I get home, that's what I do. I watch stuff." 2:36 P.M. TUESDAY, AUG. 14 Cooper, back at CNN, is conferring with Kerry Rubin, his show's senior producer and head booker, about his next trip to a certain hotspot wracked by violence. We cannot reveal where here, and he's very much interested in making the trip. But it's probably not a journey he can make until after the midterms, it's decided, although Moore suggests he go on a weekend. "Then you can do the show from down there on a Monday," he says. 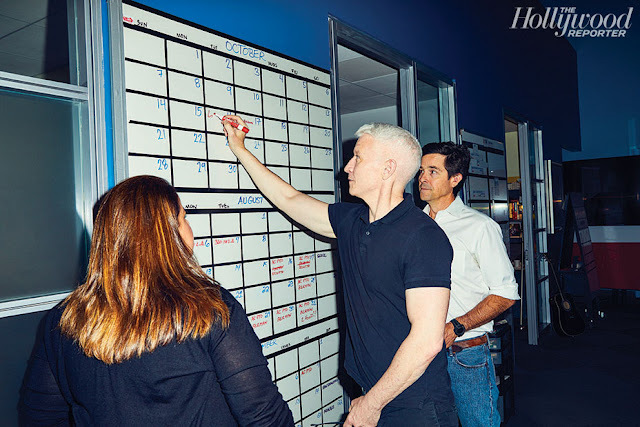 2:47 P.M. TUESDAY, AUG. 14 Cooper and his CNN publicist, Shimrit Sheetrit, are in the newsroom, looking at a giant dry-erase board listing his schedule for the next couple of weeks. The date they're focusing on is Oct. 17, when Cooper will receive the Walter Cronkite Award from Arizona State University. Cooper writes "Arizona" on the calendar. His publicist laughs. "Why do you write out the word — why not just write 'AZ?'" she asks. Cooper throws up his hands. "This is why I don't touch the board," he says. Because his show requires him to be tethered to a studio most weeknights, Cooper generally sticks close to New York. He does most of his field reporting, including for 60 Minutes, on weekends. He's already got six pieces in various stages of production, including a story on the perils of the Bitcoin economy, another on Monaco and a profile of artist Mark Bradford (Cooper has a large Bradford canvas in his West Village home). The Bradford piece had been originally assigned to Charlie Rose, before Rose got fired for sexual misconduct. “[The story] was floating out there and I was like I’ll totally do it,” Cooper says. 8:01 P.M. TUESDAY, AUG. 14 It's showtime again. The AC360 staff is in the control room, while waiting in the wings is White House staffer Lynne Patton. It's day two of the Omarosa media tour, and Patton is the designated administration defender on tonight's newscast ("Use the exclusive tab for the Patton interview," Moore tells a technician in the control room). At 8:04, after Cooper has run through the show's intro, Patton, clutching a file folder, sits down for her interview. "Is it appropriate for the president of the United States to call people dogs?" Cooper asks, referring to a presidential tweet earlier in the day in which Trump called Omarosa a "crazed, crying lowlife" and a "dog." Patton, consulting her notes, responds that Trump was simply "biting back." Cooper barely stifles a laugh but keeps plugging away with questions, most of which Patton answers only after glancing into her files. The interview lasts until 8:22. "I was going to ask her, 'Are you reading from your notes?'" he says afterward. "But I didn't want to sound snarky. She was nervous enough." 8:30 A.M. WEDNESDAY, AUG. 15 Cooper sits at the kitchen island of his West Village home eating a bowl of granola (Bourdain would approve). He lives in an 8,240-square foot firehouse, which he bought in 2010 for $4.3 million (he's said to earn $12 million a year at CNN) and spent years restoring. The interior still includes the original metal spiral staircase and brass fire poll, though Cooper did install an elevator. The second-floor salon is an imposing mix of taxidermy (animals include a grizzly bear and a decapitated sheep's head) and Old Master paintings (including Andrea Vaccaro’s The Martyrdom of Saint Bartholomew, which captures the final moment of Bartholomew’s life before he is flayed alive and beheaded. He also has a collection of hand-painted signs picked up on trips to Africa and Cuba, most of which hang in the back staircase, along with other artifacts from Cooper's life, like his great-great-grandfather's commissioning notice during the Civil War. There's also a photo, taken by his friend Tim Hetherington (who was killed in Libya in 2011), showing a younger Cooper disembarking from a helicopter in Afghanistan. Wearing a Kevlar vest, squinting into the camera, he's oozing war zone machismo. Cooper looks at the picture and laughs: "I look like such a douche," he says. 9:48 A.M. WEDNESDAY, AUG. 15 Cooper leaves home and heads uptown for a visit with good friend Kelly Ripa, after which he'll go to the gym. "It's an underground gym on 19th Street — meaning it's in a basement," he says. "A lot of very large people work out there. I don't belong." But he recently introduced Dwayne Johnson to his gym, and this has upped his credibility there considerably. Cooper also belongs to Equinox, where he's been doing Pilates since aggravating his back while riding in a Coast Guard helicopter covering the Houston floods. But his cred there, where he exercises in a windowed studio overlooking the gym floor, is less elevated. "Inevitably, I have to stop at least once per class to go outside and ask somebody to stop taking pictures," he says. "I get it, I'm doing these ridiculous movements — it's an easy temptation." 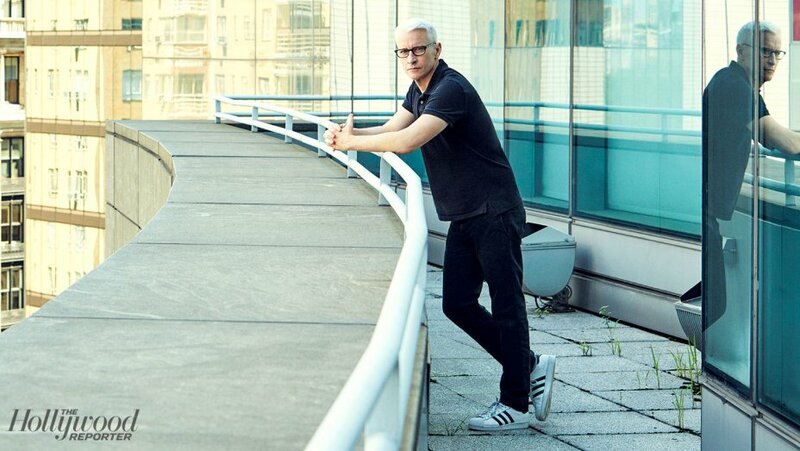 6:24 P.M. WEDNESDAY, AUG. 15 Cooper walks the three steps from his office to the set of his Facebook show Full Circle, which is actually just a stool next to a small round table near a window in the newsroom. Launched in July, it's a live 10-minute show that lets viewers pick the stories they want to watch and occasionally ask Cooper questions. After an interview with Christine Hallquist, the first transgender gubernatorial major party nominee, Cooper takes one from a Facebook user named John. "How do you balance life on-air and off-air?" Cooper thinks for a moment, frowns and offers a keeping-them-honest sort of answer. "I don't really have a life off-air," he says. "It all blends together." I think AC has a great life off-air, I know he likes to be super busy, but I think we know he has some pretty awesome downtime when he does slow down. The firehouse is awesome and Lilly is lovely and adorable. And I don't really believe it's just him and Lilly alone in that firehouse but that's another story, lol. Isn't it about time one or more of the CNN anchors say point blank: "Whatever happened to the nomination of Merrick Garland?" You remember the nomination that was stolen from President Obama? Maybe this is the time President Obama throws that out while he's campaigning for Democrats....just a reminder of the facts as we know them.